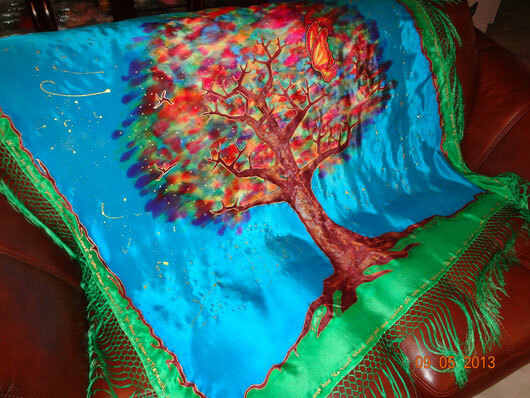 Tree of Life Prayer Shawl - 3 Strand Cord Silks - Glowing Silk Flags & Billows based on the Bible, Jesus and His Church, to enhance your worship of God! Glowing Tree of Life Prayer Shawl blooms with bursting color! Butterfly signifies angelic presence. 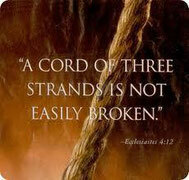 Roots of the tree are "planted" in the Proverb, "Desire fulfilled is a tree of life", and other healing and life-affirming Scriptures are written in gold. Roots wrap completely around this shawl, ending in 7" fringe. Simply beautiful. 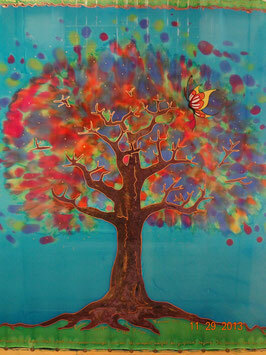 Inspired by the ministry of healing, the Tree of Life Prayer Shawl speaks of the Source of Life! 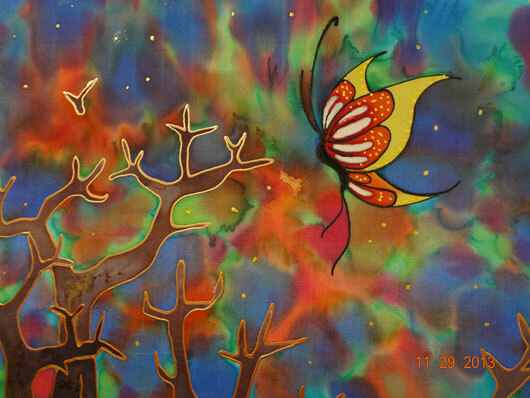 Tree is glowing with vibrant color, while a delicate butterfly rests in it's branches. Healing Scriptures written in gold. Fringe is 7" all the way around, and dyed to match the design ~ all on glowing silk that feels like a heavenly embrace. Shawl is about 45 x 45".